The birth of a child is one of life’s greatest joys! It’s a time of new beginnings and endless possibility. It’s a time of celebration. It’s a time for families to cherish and remember. A Gift of Love. A Gift of Life. The Friends of Mercy Foundation gives new parents, grandparents, friends and loved ones the opportunity to commemorate this extraordinary day for years to come by participating in our Special Delivery Footprint Wall at Mercy Hospital Southwest. 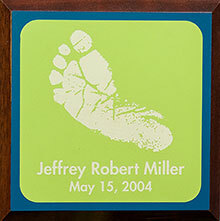 By purchasing a footprint plaque for display on our wall, you not only celebrate the birth of your little one but also support the important programs and services provided by the Family Birth Center and Neonatal Intensive Care Unit (NICU) at Mercy Hospital Southwest. Each individual plaque is personalized with baby’s name, birth date and footprint and will be displayed on our Special Delivery Footprint Wall in the Family Birth Center at Mercy Hospital Southwest. 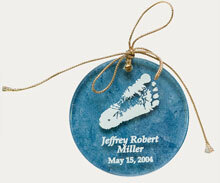 You can also order a special etched glass keepsake ornament inscribed with baby’s name and birth date to take home with you as a wonderful reminder of the joyful occasion. Of course newborns aren’t the only ones who can be recognized on our Special Delivery Wall! Older brothers and sisters, teens and even adults may all enjoy this gift of love whether they were born ten days or ten years ago.